My husband and I planned a bit of a spur of the moment trip to Leipzig and Dresden recently and booked cheap flights with Ryanair. We did not want to pay the baggage fees (Â£40 one way for one bag! ), so we decided to pack into our good old LL Bean Deluxe Bookbags. I’ve had mine since the mid-90s when I was in High School, and my husband got his about 8 years ago. These bags were made to last, so I can highly recommend one! They hold 32L, and weigh around 600g, so perfect for a carry-on! We were going away for 5 days, one night would be in an Ibis in Leipzig, and the rest of the trip we stayed in an apartment in Dresden. I packed with the plans that I would wear everything at least twice, and if I needed to I knew I could wash things in the sink. All my clothing fit into a single packing cube. I also had some zipper top plastic bags in the bottom of my cube in case I needed to separate any dirty or wet clothing or in case the airport didnâ€™t accept my toiletries bag and made me swap it to a plastic bag. I deliberately picked a sport skort for having shorts built in to protect my modesty when I crouched down to take photos and also to help with preventing chafing. I took sport tops for their quick drying technology so I had the option of washing my shirts in the sink. The long sleeved top I packed along was one that has mesh shoulders and upper back, so it still kept me cool even in the heat. I even packed sport knickers for their quick drying properties. I worked out that I actually only needed to pack 2 pairs (plus the pair I wore on the plane) as long as I was religious with washing them, but I decided to take a third pair along for a spare. And I actually wound up adding in two more pairs because I had the space for them. I also added a bralette, which didnâ€™t work out the way I had expected it to. I packed slippers over flip flops since we were going to be in an apartment and I knew I wouldnâ€™t need them for the shower. In Germany and Austria (at least), it is usual to remove your shoes when you enter a home, so we always pack hausschuhe when we visit these countries and are renting apartments. The nesting snack boxes are from Paperchase, and they are excellent for travelling if you plan on making packed lunches while you are away since they take up very little space in your bag. We also took along reusable drink cups that could hold both hot and cold drinks in them since we had a rental car with cup holders. We just took the cheapie Â£1 cups you can get in Starbucks, so nothing fancy. Curious about the bread bag/clip? In Germany and Austria (and likely other parts of Europe), fresh rolls daily is a thing. You can buy them in the grocery store or from a bakery, but the bags they sell them in donâ€™t keep the bread fresh longer than a day. Since our trip was so short, we didnâ€™t want to have to deal with getting bread daily, so I packed a bread bag and took along a bag clip. This actually worked and our bread remained fresh for the duration of our trip! You also might notice laptop charger, but no laptop. My laptop fit into a sleeve in Timâ€™s camera bag, so I only needed to pack my charger. However, I had plenty of space, so I could have easily slipped my laptop in. The tights and socks were the only ones of each I packed as I planned on washing them in the sink. I forgot to wash the tights and wished I had them on the return trip! I also didnâ€™t need the body warmer again until our last day, but I needed it on the UK side the day we left and knew I would need it in the UK once we landed. Wearing it on the plane meant it didnâ€™t take up any space in my bag, though I did have room for it. I wore my denim skirt the day after we landed and on the way home, and wore the skort the other three days. 1	Did I wear all my clothing packed? At least twice? If no, what and why? 2	Did I use all outerwear/accessories? If no, what and why? 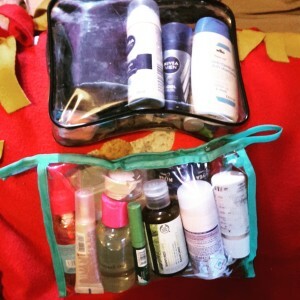 3	Did I use all toiletry items including cosmetics but excluding first aid kit? If no, what and why? 4	Did I have to buy anything for immediate use? What? 5	Did I use all electronics/electronic accessories packed? If no, what and why? 6	Did I use all other items not previously categorised? If no, what and why? 7	Is there anything left unused that can be eliminated from a future trip? 8	Is there anything used on this trip that you do not want to pack again? 9	Was anything missing? Anything you felt like you should have packed? 10	Did the bag hold up? Was it too heavy or awkward? 11	Will you travel hand luggage/rucksack only again? These questions apply to my main bag only. My personal item is my camera bag/purse and contained my DSLR, zoom lens, other camera accessories, and purse. I did not use my zoom lens, but itâ€™s not something I would eliminate from a future trip if I was taking my DSLR. 1. Yes, I wore everything I packed at least twice, and in some instances more than twice. Except for my knickers, since I took enough pairs to last the whole trip. 2. No, surprisingly. It didnâ€™t rain at all on our trip during the day so I never needed to use my mack in a pack. It also stayed ridiculously hot, so I never needed to add on a layer of wrist warmers. 3. No. Items left unused at the end of the trip were blush, eyeshadow, lipstick/gloss, and mascara. I used the BB cream daily as it had SPF in it and set it with setting powder, but I never used the other make-up items as it was just too hot for make up! 4. Yes – My folding brush broke the first day so I had to pick up a new one and we purchased sunblock in the airport before we left. I didnâ€™t like the toothtabs, so I bought some toothpaste too. 5. We never tried out the HDMI cable (we were too tired each night!) and I didnâ€™t need to use my card reader. 6. Yes. Er, I think. Iâ€™m sat in Starbucks enjoying the air conditioning while my phone says itâ€™s 32C out, so I canâ€™t double check everything. I think I had a leftover zipper top plastic bag, but that was it. Oh, I didnâ€™t use all of the tea bags or eat all of the HiFi bars packed, but I left them behind. I didnâ€™t know if we would need lots of tea bags or if I would be hungry daily for a bar. 7. This is a good question, and a puzzling one. Iâ€™d love to eliminate the rain coat, because it takes up a chunk of space, but rain is one of those unpredictable things. Originally, it was supposed to rain on our trip! An umbrella would take up less space, but an umbrella is less convenient as it ties up a hand to hold it. The travel cups turned out to be an excellent idea as we had a rental car and were able to pour water and soft drinks out of larger bottles and have it easy to hand. Probably wouldnâ€™t take the travel cups on a trip we arenâ€™t renting a car on, though. 8. No more bralette. Ugh. I really hated that thing. It offered no support whatsoever and I felt like I might as well have been wearing no bra. I think Iâ€™ll either just make space for a second proper bra (and I had space!) or Iâ€™ll have to hope I can wash/dry my bra overnight at least once during a trip. Or maybe use a bathing suit top as double duty. The Boots tea tree blemish stick I removed from its original packaging did not work out. It became dried out and unusable, and I would have had room for the original packaging anyway! I also didnâ€™t really like the Yes To Cucumber facewipes, but they were passable. 9. I wanted a second pair of shoes desperately. The heat made my feet sweat in my sketchers so badly and it was just gross. So either a second pair to alternate or maybe just some powder to sprinkle in my shoes daily to keep them feeling fresh. And as mentioned above, a second bra. I also wished I had another top along because I had spilled something on my shirt at dinner and had to wear my pajama T-shirt out that evening since I didnâ€™t want to swap into my only other clean shirt for a few hours. So another top would have been nice. I also wished I had some tea tree or acne fighting face wash along as I broke out pretty badly on my chin (though it was bacterial/an allergic reaction), I wished I had something better than Dove to wash my face with. 10. My bag is basically indestructible. The only problem it has is that it lacks structure, so I wouldnâ€™t take it hiking or anything like that but itâ€™s pretty good for point a to point b. It did get a little heavy (even though it only weighed 6KG on the return) when I was stuck wearing it going through the long queue at UK immigration, but for the most part it was fine as I wasnâ€™t wearing it for very long periods of time. 11. Absolutely. Though my next trip my ticket includes a checked bag and we want to bring along a tripod and some other non carry on items, so we will be checking a small (itâ€™s still carry on sized) suitcase between the two of us. We’re off back to Germany soon, but for a longer trip. Hopefully, I can still keep it minimal! I have not been compensated by any of the companies mentioned in this blog post, however some links might be affiliate links where I earn a small commission. 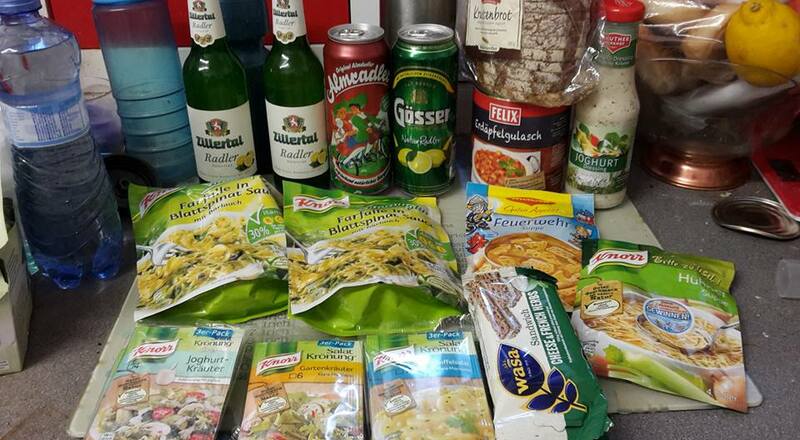 A selection of food and drink souvenirs from Austria. Going to a local grocery store first of all can cut down on food costs while travelling. Even if you’re not self-catered, you can pick up snacks for your visit or in your room – a box of cereal bars that will last for 5 days is going to be cheaper than buying them in singles from the corner shop. Same with a bag of apples. Buying beer or other alcohol to drink in your room can cut down on your bar bills tremendously, and if your room has a kettle, you can stock up on tea, cups of soup, etc. And if you packed a spork and a set of nesting plastic boxes, you can even pack up your own lunches to take with you when you’re on the go. Second, you get a better feel for the language if you’re in a foreign country and don’t have knowledge of the native language. Everything in a grocery store is labelled and sometimes there are even pictures of the item. For example, with a pile of lemons in Germany, you will see the word “Zitrone”. Now you know when you go out to a restaurant and see the word “Zitrone” on a menu the dish contains lemon. 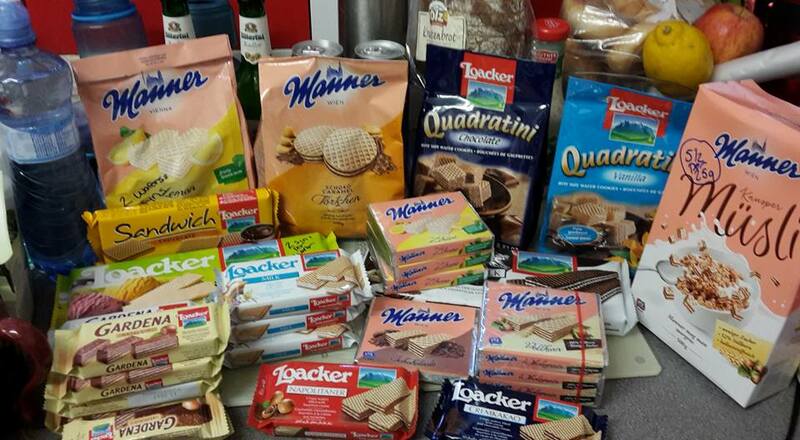 I bought zitrone wafer cookies in Austria, and other flavours. Third, it can help to get a flavour for local food. Check out the bakery section to see what breads and pastries the locals buy. Head to the deli section and see what meat (if you’re a meat eater) is popular. Look at the local beer options if you’re a drinker. And check out the chocolate aisle! Don’t forget buying chocolate at the grocery store will be a lot cheaper than buying it at a convenience store. Fourth, as you can see from my photos, bringing back food as souvenirs is fun! Feeling glum in the middle of Winter knowing your next holiday is months away? Break into some chocolate or make a bowl of soup. Giving food to friends and family is great too – everyone loves cookies and chocolate! Need a gift for a beer drinker? How about a few bottles of a local brew (space permitting, of course!)? Fifth, if you’re really feeling homesick, or are travelling with children who might need a dose of “home”, you can always head to the grocery store and look to see if they stock a similar product or if they have an import aisle. Imported items will be expensive, but sometimes, you just need it. As an American now living in the UK, I can vouch for sometimes just needing a dose of “home” and yes, I have paid Â£2 for a single can of Root Beer. And lastly, shopping in a grocery store can be fun! 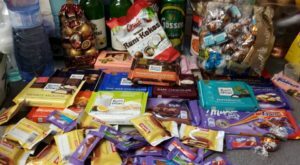 Check out this short video I made while Tim and I were shopping in a Billa store in GmÃ¼nd and at a MPREIS in Werfen. Disclaimer: I received no compensation from products pictured in my photos or video, nor did I receive compensation from the shops visited. I know I previously posted about packing toiletries in my Packing for Autumn in Austria blog post, but I decided to expand on it because I’ve been watching a lot of travel videos on youtube and a lot of “minimalist packing” videos and the amount of toiletries is insane! Someone went down to London for a weekend and they took a massive bag and then a huge train case full of toiletries and make up. Our weekend trip to London? A rucksack and the TSA sized baggie of toiletries. And some of the international travel ones make me laugh too. Americans visiting the UK or the EU, Brits visiting America…..people, none of these places are third world. If you run out of something or forgot something, you can buy it. I decided to make my own “What’s in my Bag?” video sort of as a rebuttal, and as a way to show people who are looking for ideas on what they could do to pack into smaller bags. When we went to Austria, we each took a backpack and shared a wheeled suitcase. And the toiletries in this video and post are what we took with us and what I’ve taken before when we took backpacks only to Ireland to meet up with my cousins and it’s generally what I even take for a weekend away since it’s all basically what I use on a daily basis, although a single overnight I’ll take a lot less….I’ll detail that below too. -Travel electric razor. I think its a Phillips, I’m not sure. I bought it at Boots when Boots had men’s razors on 1/3 off just before our trip to the states last May and it runs off AA batteries, so no charger to pack. -Shampoo. He uses a 2 in 1, whatever is on sale usually. I think that might be an old bottle refilled. -Aftershave. It’s in a little (30ml) bottle from Muji* because he really doesn’t use much on a daily basis. -Deodorant. Whatever is available in the travel size. -Deep Heat. This is in another bottle from Muji. We both use this for sore muscles especially after a long day of walking! -Tums/Pepto/Lemsip. Again, because his bag has room for it. We just travel with the things we might need if we get ill. Chances are, if we’re on a longer trip, one of us will get a slight cold or an upset tummy. As you can see, not much. I think that’s pretty much all Tim ever needs even on a daily basis at home. Oh, and if we’re going on a longer trip, he’ll also pack his wet razor and a travel thing of shave gel. If he needs a brush, he just uses mine. Some of Tim’s things are from gift packs he was given for various gift giving occasions. We keep all that stuff in a drawer in the bathroom and pull things out as they’re needed. For myself, I use one clear plastic bag that is size appropriate for a carry-on and then usually a second bag with my non liquids. I think my liquids bag might have come as part of a kit, either designed for travel, or with other stuff already in it. I had it in a box full of make-up bags (seriously. I have loads of free with purchase bags) and since it was clear and the right size for travel, it got used. My non-liquid bag is a Cath Kidston 20th anniversary wristlet that has served many purposes in it’s life so far**. -Shampoo/Conditioner. I’m just refilling the bottles I bought ages ago with whatever I’m currently using. I saw on a video someone actually combined their shampoo and conditioner to make a 2 in 1 in a single bottle, and I might give that a trial at home to see if it really works…..if it works, I expect I’ll do that the next time we travel! -bodywash. Whatever I currently am using, usually decanted into whatever container I have around. Again, I’m not fussy. -Deodorant. I prefer the Nivea Pearl stuff as it doesn’t agitate my armpits, but if that’s not available I’ll grab a different brand. -Facewash. I bought 100ml foam pumping bottles off eBay before our trip to the US in May. I haven’t seen this in a smaller size anywhere yet, but if there was one I’d get it because even on a long trip I only use about 30ml as it’s a foaming pump so it distributes a lot per pump! I use a tea tree oil wash from Boots. -Moisturisers. I bought the small tube at Muji and it’s filled with Boots Vitamin E face moisturiser. I also take a Nivea cream pot, since that’s good for all over the body. In the same vein, I always take a small pot of vaseline (it’s the lip stuff, but really it’s all the same). And there’s also a pot of Blistex lip balm. I recently discovered Lanacane anti-chafing gel and it’s amazing. -Tea tree oil spot treatment gel and night cream. Zits happen. Especially when travelling. -Antibacterial hand gel. I have a whole little drawer full of bath and body works mini hand sanitizers, so I just grab one in a scent appropriate for the season. -Febreeze. Again, it’s in a bottle from Muji. Always handy if you plan on re-wearing clothing. -Body Spray. I currently have Mist You Madly by Soap and Glory in a small sprayer I bought off eBay. -Under eye brightener. Because I sometimes don’t get a lot of sleep on trips if we have late nights and early mornings. -Travel hairbrush. Â£1 at Primark, though I just got a tangle teezer, so I might have to rethink this as the teezer is bigger (and I’m now obsessed with brushing my hair!). -All-in-one Makeup pallet. Keeping it simple. 2 neutral eye shadows, blush, and a mini mascara in one little pallet. -Face powder/Brush. Self explanatory. I wish they made these in a mini version. I’ll take any brand, so if you know of one, let me know! -Lip crayon. It was in my advent calendar this year, but basically, I always have some kind of lip colour thing with me. -mini first aid kit. just some plasters, blister band-aids, and antiseptic wipes. This goes with me when we’re out and about, too. -mini medicine cabinet. Or at least, that’s what Tim calls it. It’s a weekly pill organizer I repurposed with all the little OTC things you might need – paracetamol, ibuprofen, kwells, pepto, and enough of my prescription Metformin for 2-3 days (any longer and I’ll add a strip of meds to my bag). -Travel Razor. I got one of those Venus Snap ones and I love it. I’m hoping it’s in the bathroom and not left at Mom’s in PA! I’m not bothered about gel, so I’ll usually pinch a bit of Tim’s. I only take my razor on trips longer than a week because I’m lazy. -Dry Shampoo. Depending on how long the trip is for, but this is handy especially if we have to be up early in the morning and shower the night before. -Face wipes. They’re good for everything from their actual purpose to spot treating a stain or cleaning off a dirty table on a train. I usually grab the cucumber scented ones from Boots. They live in an outer pocket of my backpack when we’re out and about along with the first aid kit and pill container. -Sun cream. Depending on where we’re going and the season. My face cream has SPF15 built in, but if we’re in FL or it’s the Summer, we usually take along a mini size of a sun cream and then buy more when we’re at our destination. Our three week trip to FL and PA last May we went through 3 cans between the two of us because Tim is a pasty British man and when he visited the US in the Summer of 2009 when we were dating I neglected to think about sunblock because I didn’t need any and he blister burned. And if we’re packing sun cream, I’ll probably pack a 100ml bottle filled with some aftersun too. And, I think that’s everything. Anything else that we need or run out of we can easily pick up at a chemist/Apotheke***/grocery store. I tend to buy us pre-packaged travel sized bottles over refillable ones (And then refill them!) because if we need toss things due to space it’s not a huge loss, but Muji and Superdrug are both great places to get refillable bottles. Obviously, I use refillable bottles for things that either aren’t available in travel sizes or are specific products we need (like my Hibiscrub). And if we’re going to the US, we’ll only pack what we need for the first night in the hotel in London and usually make CVS our first stop (although now I have things at my cousin’s house in FL and my Mom’s in PA). For those trips, we usually take the dregs of a previous trip’s bottles and then we toss them in the morning. I don’t wear a lot of make-up on a daily basis, so the items I pack is pretty much what I’d use on a day I felt like wearing make-up. When we went to the US in May for Laura’s wedding, I also took a whole bag full of my special occasion make-up. I don’t pack many “what ifs?” because I think they take up a lot of space and I could probably fill a train case full of things I “might need”. Just about the only what ifs I take are all medical related – medicines, first aid, and creams/balms. And that’s because I know I will need those what if items. I’m accident prone. Chances are, I’ll cut my finger open or bang my knee against a table and need pain relief or plasters. My rule is always if there is something I discover I need, I can probably buy it. If it’s not available where I’m travelling to, well then I probably didn’t need it. When we go on single overnights, I won’t pack all of this. If we’re spending the night with a local friend and planning on coming home straight away the next morning I might only take deodorant, face wipes, moisturiser, toothbrush/toothpaste, body spray, a hairbrush, and dry shampoo because I’ll shower when we get home. If we’re spending the night down in London and travelling by train, I’ll probably take shampoo, conditioner, hibiscrub, face wash, deodorant, toothbrush/toothpaste, body spray, and a hairbrush. The little Clinique pallet will usually go into my handbag along with a lip gloss and a little concealer if it’s a short trip as my Cath bag might wind up being my purse on those trips! But Boots often does 3 for 2 on the travel toiletries, so it’s super easy to pop into one on our way through King’s Cross or St Pancras. *Muji is a Japanese store that has a few UK locations. I stumbled onto them when I had one of my “Day of her own”s in London back in August and they have all sorts of travel sized bottles — loads more than they show online. **It’s been used as a purse, a camera bag, a make-up bag, a cords organiser, a handbag, a pencil case, and probably about a dozen other things. It’s super versatile! The ribbon strap is surprisingly strong and the inside is lined with red spotted fabric and it has a little pocket on the inside too. ***Apotheke is the German word that signifies a chemist. In Austria, it’s a giant A on the outside of the building. We needed one twice on our trip, once for some plasters and once for some additional deep heat.